If you wish to know how to buy ruby jewelry, read the article given below. Check out the tips on buying ruby jewelry. Rubies are the red members of the corundum family of minerals. These gemstones are available in various shades, which add to its splendor. Natural ruby shades vary from light to dark red. Rubies also have undertones, such as a purplish cast. These variations in colors and shades, add up to the charm and individuality of each gemstone. It is for this reason that buying ruby jewelry is a universal favorite. Moreover, as color red is associated with the universal feelings of love and passion, ruby jewelry has always been in demand. If you are now wondering how to buy ruby jewelry, read the tips given below. Rubies as gemstones are very hard and do not deface or scratch easily. This is one of the most easily distinguishable features of rubies. Rubies are very durable and so one should not worry about minor knocks and impacts. Moreover, these gems may or may not have inclusions. This implies that the stone will display fine lines or spots within itself, when held up to the light. However, a good quality ruby is clear with minimal inclusions that would not be visible to the naked eye. It should be noted that the presence of inclusions does mean that the stone may crack or chip. Nevertheless, rubies should not be worn while doing any strenuous work, or while working with appliances. The size, the quality and the color of the ruby are the deciding factors of the price you pay. For instance, larger stones are more expensive. Similarly, clear rubies with little or no inclusions cost more as compared to the ones with visible inclusions. Moreover, a ruby without inclusions costs higher than a bigger one, which has some inclusions within. Blood red colored rubies are considered to be of highest quality. 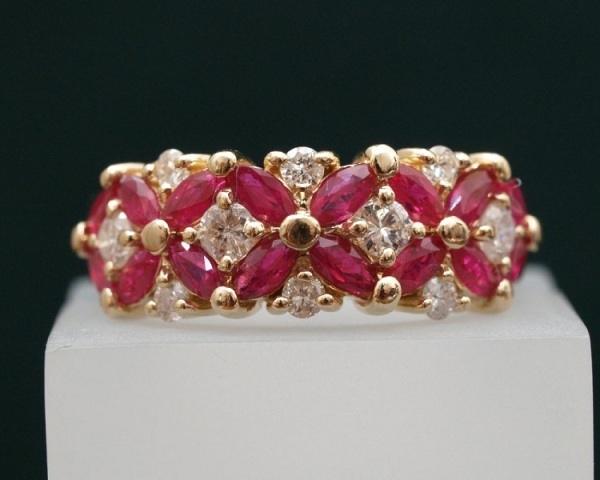 However, rubies are available in almost all shades of red, including pink. One should understand that unlike diamonds, rubies can never be totally flawless. Therefore, one must shop around for the best deal on a particular ruby of specific size and with defined inclusions. Compare prices on similar stones in weight and clarity at different jewelers to strike the best deal. Vivid and blood red rubies are the finest and the most expensive. Ask the jeweler to examine your ruby under a loupe or a microscope. If it shows a cloudy appearance due to the inclusions, do not buy the ruby. Avoid rubies with inclusions that reach the surface as they make the stone weaker and with a tendency to split along the crack. View your prospective ruby item under proper lighting. Do not view the ruby under fluorescent lighting as it lacks red color and make the assessing of gemstone impossible. In effect, view the ruby under a variety of lights, such as incandescent and daylight.